Backdrops were the exception on model railroad layouts a half-century ago, but nowadays most layouts feature a painted backdrop of some sort to add realism, depth and conceal unwanted background features like walls, pipes and water tanks and softeners. 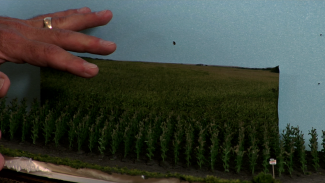 In this video, Master Model Railroader Gerry Leone shares some tips on selecting an appropriate material and how to paint model railroad backdrop without any prior artistic skills needed! Gerry enumerates several typical materials modelers use for model railroad backdrops, such as rolls of aluminum or linoleum, sheetrock or drywall, but his favorite is ⅛” masonite (tempered hardboard) because it curves easily and takes paints on its smooth, tempered side very well. Considerations in selecting a material are how big will the backdrop be, and whether it will be straight or need to bend around a corner. Next, he recommends getting several blue paint chips from a paint store and view them under the lighting of your layout to see which color best matches sky blue. Remember, blue paint looks different in sunlight, incandescent, fluorescent and LED lighting, so experiment and see what looks best to your eye under your lighting conditions. 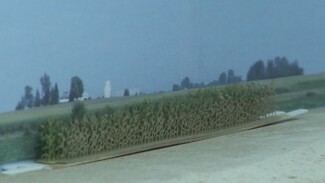 And always use paint with a flat finish, never satin or gloss for your model railroad backdrop scenery. To paint quickly, smoothly and efficiently, Gerry uses a Wagner Airless Paint Sprayer (also usable for myriad paint tasks elsewhere around the house!). He paints the entire backdrop (doing several pieces at a time) in the sky blue paint (diluted with ½ cup of water per gallon) and allows to dry. 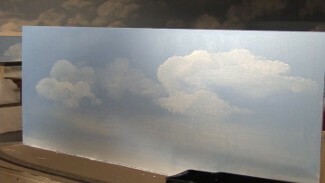 Then, using a 4 parts white paint to 1 part sky blue, starting just below the bottom edge he feathers the lower third of the backdrop with the white-blue mixture to look like the sky does near the horizon. 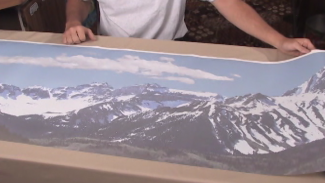 Allow the backdrops to dry in a dustless environment for several hours before handling. Since he’s using an airless sprayer, some paint will undoubtedly splatter in places where you don’t want it, so he recommends using drop cloths to cover either your layout and wall (if you’re spraying the backdrop in place) or protect your floors wherever you’re doing the task. Gerry also uses eye, ear and breathing protection. And, he says, first practice on a test piece of masonite to hone your skills. Follow his easy tips and you’ll be surprised how easy it is to paint a model railroad backdrop that looks great and is more effective than using a brush roller.